Ford's latest experiment with the “World Car” concept is in its second year now, after receiving mixed reviews and selling at a lower pace than Ford might have wished during its first season. Called Mondeo throughout much of the world, the compact sedan carries either Mercury Mystique or Ford Contour badges here. How different is Ford's World Car from, for example, a Japanese-designed Toyota Camry that's built in the U.S out of Japanese and American-sourced parts? In concept, not very; Mystique and Contour are mainstream cars for their class, and are assembled in the U.S. (and Mexico) with components sourced from around the world. Much the same can be said for other players on this field, from Honda's Accord to Nissan's Altima to the Chevrolet Cavalier and Pontiac Sunfire. The Chrysler compacts, Cirrus and Dodge Stratus, have more local design and hardware content than the others, and are assembled only in the U.S. But there are significant distinctions in execution. The biggest differences between the Ford compacts and their competitors are best described in the subjective area of “feel” Mystique and Contour have the road manners and performance of European cars, which, essentially, is what they are. Mystique and Contour are also Ford products, which means they are assembled and finished to a standard that matches–or exceeds–that of any of their competitors. The Blue Oval company has made great strides in this area over the past few years, and the hard work shows to advantage here. We've had a year to get used to the soft, ovoid shapes Ford stylists penned for Mystique and Contour, and much of the shock value is gone. The Mystique, in fact, has a normal, almost conservative look to it, with its low, wide headlamps and conventional air intake. The Contour, on the other hand, retains its startling ovoid air inlets and elliptical headlights. Front exterior panels aside, the two are virtual twins. 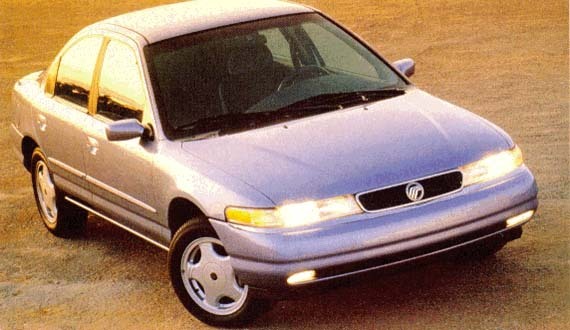 Some bright trim has been deleted from the 1996 models, leaving only wheels and badges as indicators of base (Mystique GS, Contour GL), or uplevel (LS and LX, respectively) trim and equipment. Contour is offered in an additional sporty SE version, which carries a small spoiler on its rear deck and its own seven-spoke alloy wheels. Ford is also readying a limited edition SVT version of the Contour for mid-year release, offering more power and sharper handling. All Mystique and Contour models (except the SE) list the 130-horsepower, 2.0-liter, Zetec inline, 4-cylinder engine as standard equipment, though all are available with the much more powerful 2.5-liter, Duratec V6. The larger engine comes in an option package that includes 4-wheel disc brakes, larger tires and stiffer suspension. Base transmission for either engine is a 5-speed manual, with a 4-speed automatic available at extra cost. Our test car was a Mystique LS, with V6 engine and 5-speed manual transmission. Though Ford rates the Mystique and Contour as 5-passenger sedans, they are at their best when four or fewer are on board, something that's true of any car in this size class. Interior space is limited in back, even though an extra inch of head and leg room has been carved out of the 1996 cabins by a redesign of the front seatbacks and lowering of the rear seat cushion. Even with that added space, adults won't want to spend much time in the back. All models now have folding rear seatbacks that increase luggage space. Driver- and front-seat passenger will find their part of the interior to be cozy as well. Here, there's just enough space available for comfort. The front seats have short cushions, but are otherwise supportive and suitable for long drives. Base front seats have manual adjustments that include tilt and lumbar support settings on the driver's side; a 10-way power driver's seat is optional. Steering wheel, pedals and switches are all nicely positioned, and switches have a soft surface that's easy on the fingers. Interior appearance is first-rate, from the curved dashboard to details on the door panels. Some critics feel that the dash is made up of too many separate pieces, but that's a matter of opinion; all agree that the overall look is appealing. Instruments are clear and legible. Mystique and Contour do offer plenty of stowage area in back. More, in fact, than the slightly longer Honda Accord. Trunk liftover is low, and the space is well-shaped to handle luggage or grocery bags. Aside from a few extra touches such as height-adjustable front seatbelts and a pollen filter in the ventilation system, Mystique and Contour carry a light load of standard equipment in base form. That's normal for cars in this price range. Adding desirable options pushes the price into the premium area for a small midsize car: A fully-loaded Mystique LS such as our test car crosses the $20,000 frontier. However, it also provides a few features (all-speed traction control perhaps the most important) not available on competitive cars. There are two distinct driving experiences available to Mystique and Contour owners. These aren't as much based on model choice–though the more expensive versions do have better interior trim and more amenities–as on power and handling. Certain virtues apply to all models. The body structure is quite rigid, keeping squeaks and rattles at bay while isolating its occupants from excess road noise. Wind noise is low as well, making Mystique one of the quieter cars in its class. The 4-cylinder Mystiques are fine commuter cars. Smoothness and economy are the prime criteria here, and the Zetec engine delivers on both counts. Hill-climbing and passing maneuvers are lengthy procedures, as they are with most small sedans. You'll find that the base-level Mystique has a slightly stiffer ride than its rivals. That's more than balanced out by superior controlability. The European design heritage really shows through here, delivering one of the best balances between comfort and fun we've encountered in a 4-door sedan. Things get even better in V6 versions. Our tester was a genuine driver's car, closer to BMW than Toyota in character. Stronger springs and shock absorbers keep the sportier Mystique even more firmly glued to the pavement while firming up the ride, more so than some buyers will like. But the tradeoff is worth the minor decrease in softness. Every part of the Mystique's chassis works well to create a harmonious whole. We found the steering to be sports-car sharp, body roll almost non-existent and the brakes are superb. And the engine is terrific. With 170 hp available, the Duratec can chirp the front tires from a standing start, making the traction control option a desirable addition. It's well-muffled in cruise mode, but has a healthy snarl when pushed. We'd rate it the finest engine in the compact-car field. Some early manual-transmission cars were criticized for balky shifters, but our experience suggests that improvements have been made to the shift linkage. The optional automatic is good, and does little to diminish the V6's snap. In a vast field of market-driven and somewhat anonymous people movers, the Mystique–and its Contour sibling–stand out. Either one can transform the business of travel into a pleasurable experience for the driver while satisfying the commuter's basic needs. Moreover, they stack up very well in the value-for-money department, whether in base or fully equipped form. Fit and finish are tops, too. The lack of rear-seat space remains a major handicap, however. Car-poolers will do better elsewhere, although these cars are eminently suitable for families with small kids. In every other respect the Mystique is first-rate. If your heart says “sports car” but your wallet says “economy sedan,” this is the best choice among a host of excellent offerings.